An American Plague written by Jim Murphy is the horrific yet inspiring story of the people of Philadelphia fighting the dreaded Yellow Fever epidemic of 1793. When reading the book, I was shocked to see what the citizen considered “healthy”. The sewers were above ground and when it rained all the dead and decaying animal carcasses washed into the sewers and then continued to decay. On every street at the very end, in a corner, there was a pit the sewers flowed into. The symptoms of the Yellow Fever included vomiting black fluids, sweating, and fatigue. The disease spread quickly after it made its way to the major streets killing everyone it touched. At this point, nurses were rare and valued and usually were paid fifty cents a day, but as the sick increased the nurses started to receive bribes. Their pay skyrocketed to five dollars a day. 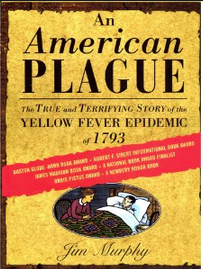 An American Plague was a great book on the Yellow Fever. I would recommend the book to anyone who has a interest in illness and has a strong stomach (there are some vivid descriptions). It was also very neat to look at Philadelphia from 1790 to 1800, and the health requirements. For example, in the basements of nicer houses they had a well for drinking water and right next to it there was a disposal pit for trash and carcasses. This let disease gather in the drinking water. With the disease in the water, it could be directly transmitted to people that drank that water. Compared to now, most people would say that Philadelphia was a very dirty cite that was just growing disease and epidemic. That is correct, except for that many of the health requirements and ways to clean and pump water came after the epidemic. Now we have all of these water purifiers, water lines, sewers, and requirements from the government. The Plague caused many changes to our world and how we all live. All and all, An American Plague was an impressive book about the Yellow Fever epidemic of 1793.